Have you’ve ever wondered what your pet is thinking? Has your pet ever seemed like he or she was down for no apparent reason? Pet’s are some of our closest allies; in fact, it’s believed that losing a pet can be more devastating than losing a family member or a friend. We tend to form deep connections with the creatures in our lives, and I feel that these connections often extend into the realm of the spiritual or even of the psychic. There are even people out there who feel that our pets have empathic abilities that help them to better understand our emotional states. One thing is for certain, when it comes to our greatest supporters: there’s more to the relationship that we have with our pets than is simply explainable by the concept of pet ownership. In fact, there is a whole branch of psychics that work almost exclusively with pets so that we can better understand the needs and feelings of our companion animals. These psychics, which are known as pet psychics or animal intuitives, understand that our relationship with pets is based on a spiritual connection. Their belief is that we communicate with our pets telepathically, which is why they seem to tuned into our needs and can often be the only beings who can truly cheer us up when we’re feeling down. Helping you to understand when a pet is experiencing an emotional crisis. Sometimes a pet’s personality can seem to suddenly change. When this happens, a pet intuitive can help you get to the bottom of the problem. Typically, this is caused by a spiritual imbalance that’s happening inside of you. Since pets are attuned to our auras, if you have a problem, the first symptom will be an unhappy pet. Helping you find a lost pet. Like traditional psychometrics, pet psychics can get a psychic impression from your pet’s belongings. When they receive this spiritual imprint, the psychic may be able to help you find your lost companion. Additionally, pet psychics can use the flow of spiritual energy that occurs between you and your pet to find out the precise location of your friend, no matter the geographical distance. It’s important to note that not every pet psychic will be able to provide this service. Helping you to deal with a sick or injured animal. Unfortunately, due to age, sickness, or injury, many times we have to eventually decide whether or not to let our pets go. 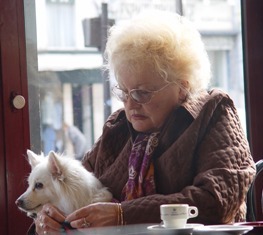 When this stage of life comes around, a pet psychic can be there to help you decide whether it’s time to say goodbye or whether you should hold on a little longer. Euthanizing our beloved animals is a difficult decision, so finding a psychic that can give you this spiritual guidance eases the burden a bit. Helping you to contact the spirit of a lost pet. When we do lose a beloved pet, it can really help us to try and communicate them in the spirit realm. Pets move on to the next realm of all life, and like the majority of spirits, they are often very willing to help you find guidance and closure. Pet intuitives use a wide variety of methods that are intended to enhance the natural psychic connection that we have with our animals. Typically, a pet psychic will communicate telepathically with your animal in order to open the lines of psychic communication. Most psychics will often get a childlike response from your pet that conveys its own particular set needs. If there is a need to diagnose a potential health issue, pet psychics will often run their hands over the body of your pet and will psychically get an impression of their overall health. This is a more tactile version of aura reading, but there are pet psychics out there who can also detect the health of your pet just by viewing their health through their sixth chakra. In addition to being able to scan your pet’s health and diagnose specific health problems, most pet psychics will also heal your pet using their own abilities or healing crystals. Pet psychics can really be helpful because they help us understand what our best friends are feeling. These psychics utilize our own deep spiritual connection with our pets in order to help return to normalcy.